The Welsh branch of the DSWA held its third taster weekend in South Wales at Libanus near the Brecon Beacons Mountain Centre. 11 branch members undertook a field wall rebuild of an existing section of wall including a corner which backed onto common land. 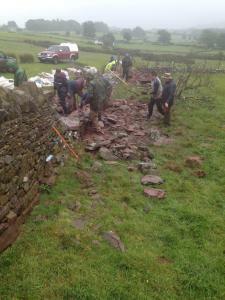 A very welcome party of eight people arrived ready to learn and receive a taste for the craft of dry stone walling. The course was also attended by two very curious dogs who couldn’t quite understand why they were on a hillside, more on them later. Saturday morning started at 08:30am and the course was treated to a few rainbows which led down to the site build. The weather conditions were very ‘Breconesk’ with horizontal light rain interspersed with heavy rain, lighter than light rain and the rare and very welcome dry but windy spell. This allowed for Pen Y Fan to reveal itself through the clouds. This was all immaterial to the party as the welfare tent kept everyone’s equipment dry and for tea and coffee to be taken out of the elements. 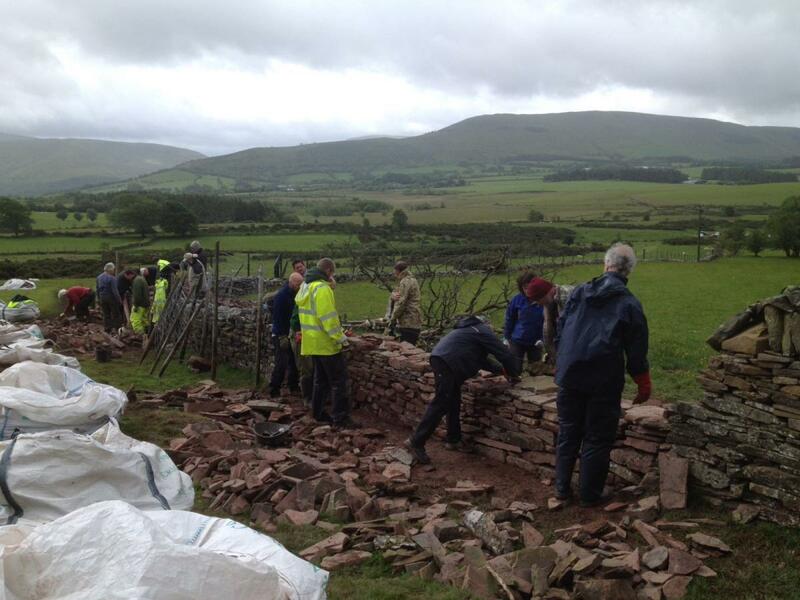 Stone had been brought to the site in one tonne builder bags and branch members quickly started rummaging through these to find suitable recycled material for the wall build. Meanwhile the ‘newbies’ were given a health and safety briefing on the delights of how not to lift, put your toes in the way and the importance of gloves, safety glasses plus staying hydrated. Yes even in the rain! The day progressed very well despite the conditions and morale was very high. The branch were pleased to welcome two individuals that had taken advantage of the pilot scheme. The scheme provides two places per course to Armed Forces veterans and those seeking employment. When asked how the day was progressing one of the individuals (let’s call him Frank) said “I am loving it, it’s great to be outside learning a new skill”. The course was shown how to strip out and grade an existing wall, then how to lay the footings. Sadly no pots of gold were found in the wall which was ‘literally’ at the end of that rainbow mentioned earlier. A little bit further down the wall the branch members gleefully started the rebuild of a much ‘traced’ wall. Your editor seemed to be most popular with our two four legged friends, at one point there was nearly a dog built into the wall as a feature. Everyone had a fantastic day despite the muddy conditions plus constant rain and wind (I say day yet some – Simon and Josey – had disappeared half way through the day to go and watch the tennis, but we won’t mention that here). The newbies were all looking pleased with their efforts and were comfortably up to the first lift with ‘through’s’ placed at 1m sections. At this point it was time for the Committee members to meet and discuss the final preparations for the Royal Welsh Agricultural Show and Vaynor Show. A separate report will be sent to all members. Everybody came back the next day including another branch member who arrived in style courtesy of a chauffeur driven tractor (fair play!). 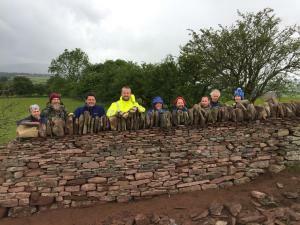 The day panned out with walling being resumed at a relaxed pace, at this point of the weekend everyone was getting to know one another (including your author, with those two dogs…..) in a relaxed and friendly atmosphere. Before anyone knew it 4pm had arrived and copings were being placed, it was time to wrap up another successful weekend. Except the success did not stop there. The branch was thrilled to welcome Paul, Kirstie, Steve, Leon, Matt and Dan into the Dry Stone Walling Association of Great Britain and more importantly our amazing Welsh branch. 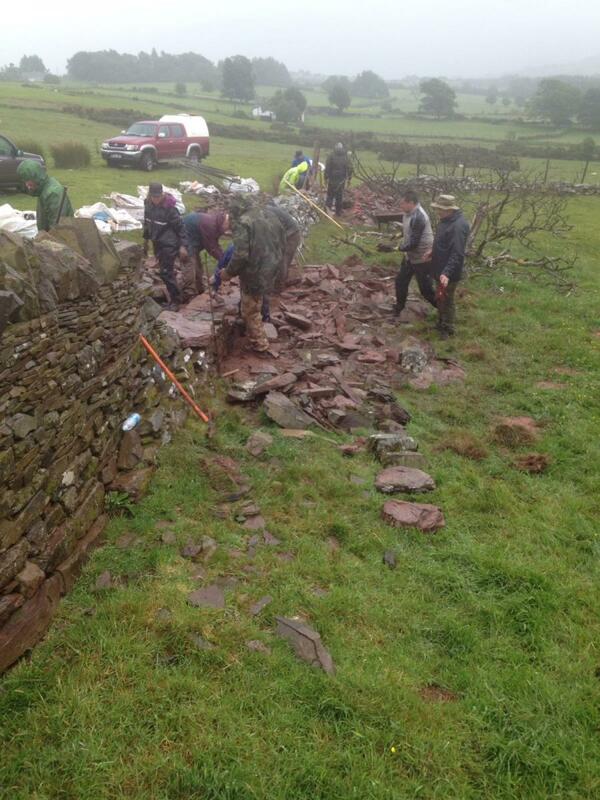 We really look forward to walling with them in the near future at shows, training and social events.